I delivered six large paintings to Sarah Wiseman gallery in Oxford last Thursday. The show is called 'Art of giving' . I had a chance to have a little look at a few other artists work that would be in the show. The show started on Saturday and is running until the end of December. Here are just a few. 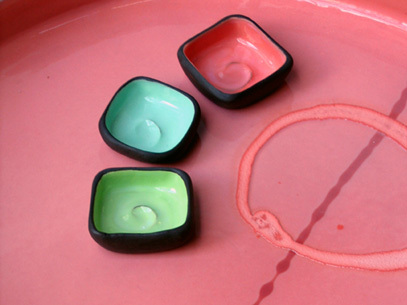 My favourite were these ceramics by Zeita Scott. Her skilfully and unusually tactile platters and cups invite you to celebrate food and the everyday use of handmade objects. 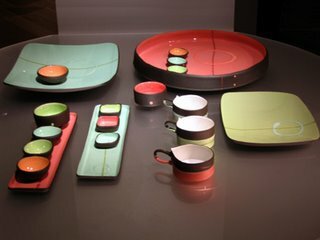 Inspired by the Japanese modular tableware, Zeita is encouraging people to use her pieces 'shuffled' in with others. They all work so well together. Mixing black clay with lush colours Zeita is creating something truly unique! This is the work of Laura. She is a graduate from the Royal College of Art and winner of "Best Newcomer" award in Bombay Sapphire Competiton, which is the world's biggest international glass award. 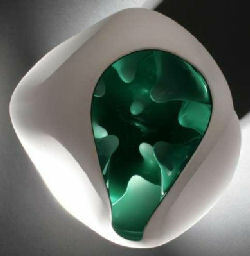 Her beautiful, organic glass pieces fuse the highest levels of creative imagination and need to be seen! I have been a bit of a fan of the work of Trevor Price for some time. This is an etching of his that just makes me smirk! I have read that his subject matter is in some way a reflection of his life. Some of the pieces are about the intimacy between a couple, and others show the normal obsessions of any man. "I am motivated by using insects; if a ladybird landed on a woman’s knee she would probably accept it. However if a cockroach walked up her leg it would not be welcome. 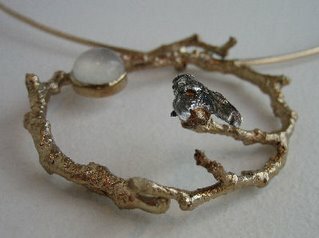 I find the thought of creating jewellery that will be worn close to the skin, from the insects she would loathe to be near, fascinating. The twisted pleasure of a woman adorned by the insects she would swot in everyday life"
If any of you are around Oxford this Christmas be sure to drop by this really is an interesting collection of work and of course there are some of my paintings there too! Ooh, what a great selection of work!...those ceramics are beautiful, and the etching super fun!